In addition to hundreds of pins featuring thousands of photos contributed by staff and clients, Your Own Italy’s new Pinterest page features dozens of curated boards designed to give those planning a trip — and those dreaming of one — exciting ideas on where to go and what to do, as well as inspirational messages and practical advice. It’s said that a picture is worth a thousand words, and we hope that our Pinterest fans will enjoy learning more about one of world’s most art-rich, food-celebrated, and nature-blessed countries! 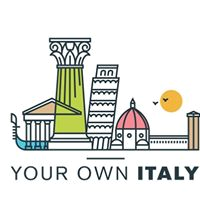 Boutique travel firm Your Own Italy, which gives clients the best of both worlds by empowering them to choose how much time they want to spend touring Italy, and how much time they want to discover Italy on their own, has arrived on the Pinterest landscape at: https://www.pinterest.com/yourownitaly. In addition to hundreds of pins featuring thousands of photos contributed by staff and clients, Your Own Italy’s new Pinterest page features dozens of curated boards that are designed to give those planning a trip — and those dreaming of one — exciting ideas on where to go and what to do, as well as inspirational messages and practical advice. The current line-up of boards include: Italian Food, Honeymoon in Italy, Florence – Italy’s Soul, Venice – the City of Romance, Tuscan Treasures, the Amalfi Coast Adventure, Roman Rhapsody, Travel Quotes, and Italy Travel Tips. Additional boards are in development and will be regularly added. For more information on Your Own Italy, visit http://www.yourownitaly.com.